Very often, when an artist is working on a "collection" or body of work that evolves around and idea or theme, a related, but new way of seeing the work will present itself. This new insight often leads the artist into another stream of thought that then leads to a body of work based on this new scheme. This is what happened to me while I was working on my Hong Kong/Shangri-La seacoast pieces. I had been working on my Shangri-La pieces for over a year when I hit upon the notion of how to make sculptural pieces that could incorporate the antique Chinese pottery shards that I had been beach-combing, into my work. My familiarity with the shards washed up from the South China Sea had been over ten years at the time of her newest idea for their use, however, I never had used them in my own work because I wanted to use them in a way that would not just be decorative, but would provide my work with a deeper meaning and level of understanding. I solved my problem of how to work with the shards when I realized that they could be physically incorporated into my Hong Kong oceanscape pieces in order to make them self-referential. By making work inspired by the terrain of the South China Seacoast and embellishing it with actual earthenware, porcelain and stoneware shards (broken pieces of old pottery) washed up from the South China Sea, I believed that I would be able to use these found objects to make a statement about China's long and distinguished contribution to the tradition of ceramics while also wryly commenting on how that same actual "china" could be used to create new "china" or ceramic work. To date, I have completed one exhibition ready piece using Chinese shards. The piece titled, "China from the South China Sea: Waterspout Vessel" was inspired by how typhoons in the area stir up sea beds and cause more shards and human debris to wash ashore at specific points along the coasts of land masses and islands near Hong Kong's shipping lanes. Incorporated into the sculpture are also seashells, a headless temple figure, and pieces of beach glass that were also found among the shards which were all collected on Poi Toi Island. 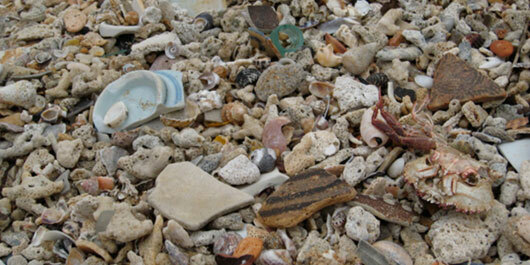 I currently have plans to construct several other sculptures using Chinese shards and other found beach combed artifacts. The titles for two of these pieces will be, "China from the South China Sea: A See Worthy Vessel" and "China from the South China Sea: Rebuilding China." Shards of china and glass found on the beach of Po Toi Island in Hong Kong. 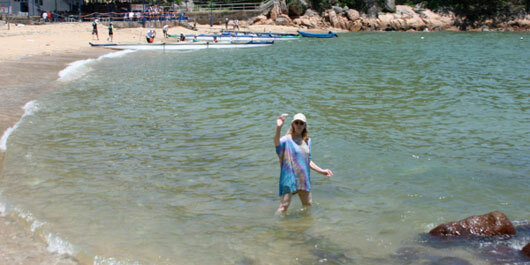 Dr. Martie Geiger-Ho collecting shards of china and glassfrom Po Toi Island in Hong Kong, summer 2009.